I have read a few fairy tale retellings but never a mythological retelling unless you include ‘Grendel’ by John Gardner. This is the story of Daedalus and Icarus – but not the one you know. Daedalus worked hard to spread his mischievous story to trick King Minos. Intrigued? I was. If you enjoy mythology, literary fiction, and even fairy tale retellings you will enjoy this. The pacing of the story is a bit slow to start but once it gets its rhythm it’s something you want to savor. For me there are two kinds of books – ones I devour and ones I like to take my time with. 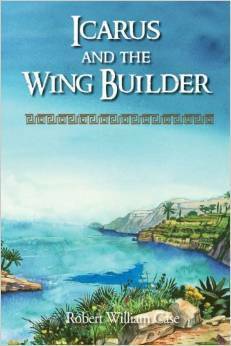 ‘Icarus and the Wing Builder’ is a book I enjoyed slowly. It’s a short book of about 288 pages but I didn’t want to rush it. Case’s writing is beautiful and the style fits the mythology and magic he’s created. Chapters are short. It allows you to digest small portions at a time, and I appreciated that. It is set up for a sequel. I’m unsure how I feel about that. For me the story seemed to end appropriately. I don’t have much interest in the continuation. I would, however, love to see what Case could do with other myths in a similar manner. My biggest complaint with this book is shallow. It is the cover. Let’s be honest, a lot of us do judge a book by its cover. I am one of those people and this isn’t one I would have picked up off the shelf. The painting doesn’t draw me in. With all the statues of Icarus and Daedalus out there I would have gone with a photograph of one of those, the many urns, or frescoes. It would match the high quality of literature in the book better. I think it would do a lot to draw people to this book rather than allowing it to be a hidden gem. – What I’m telling you is if you are like me, and the cover isn’t wowing you, ignore it and read the book.